When my daughter was Kindergarten, her teacher had a treasure box, and each student who had good behavior all week could choose something from the Treasure Box on Fridays. I don't know about the other kids, but my daughter would strive all week for this reward. It was full of little things like stickers and fast food-type toys, but she couldn't wait to be able to choose a "treasure" for herself. 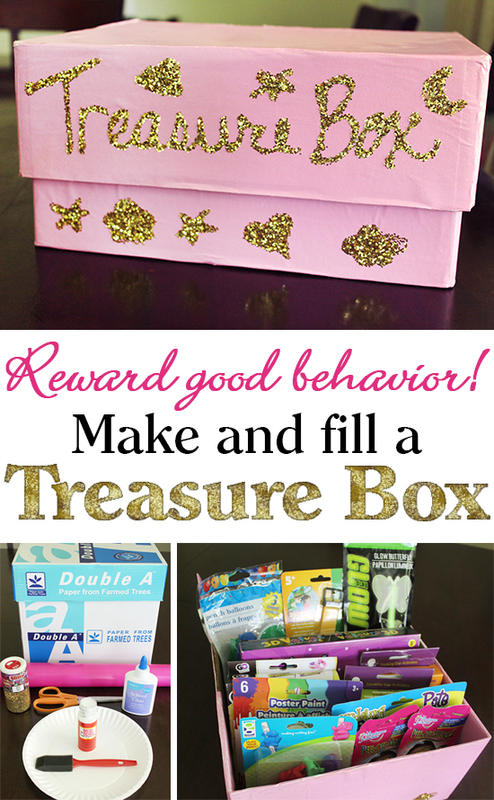 I thought this was a fantastic idea and decided to make our own treasure box for at-home good behaviors. 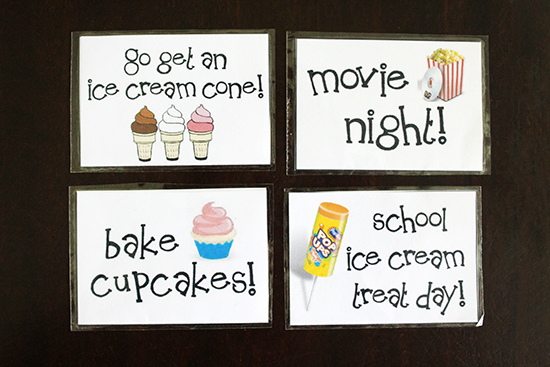 It's easy to make, inexpensive to fill, and I have some handy printables to help you pull this "Good Behavior" system together in your own home. Cut down at 2 of the corners on 1 long side of the lid, all of the way down to the top. Spread glue all over this piece. 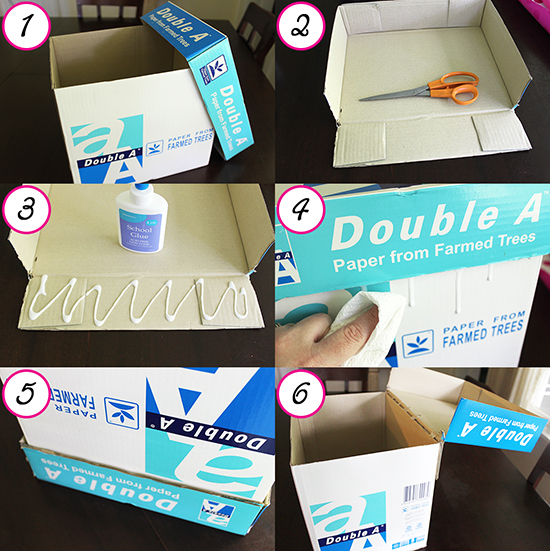 Put the top back on the box, press down firmly, and clean up any runny glue. Turn the box upside down and allow to dry overnight. You now have a box with a hinged lid! 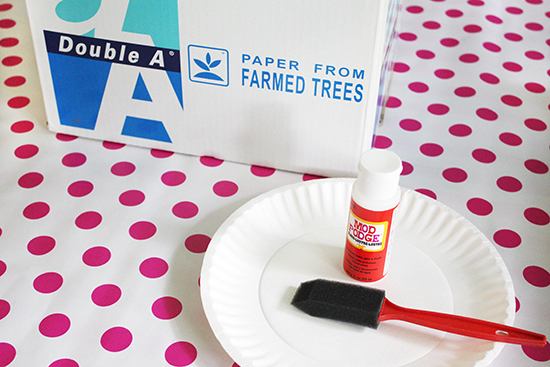 Use printer paper to cover your box and let your kids go crazy drawing and coloring it. Cover in comic book newsprint. Use paper cutouts from magazines and paste them on. Once you have your box finished, it's time to fill it! Newsflash: It doesn't have to be expensive. I got everything in the above photo for $10 at a Dollar Tree. 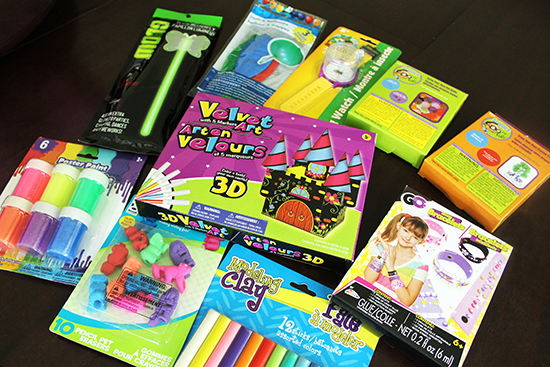 My daughter loves "projects", so I went shopping for art supplies, science projects, kits, and cute toys. At one per week, this stash will last 10 weeks. Not bad. At the Dollar store you can also find small stuffed animals, party favors, magic tricks, prank items, dolls, cars, bubbles, play-doh, glow sticks, and so much more. 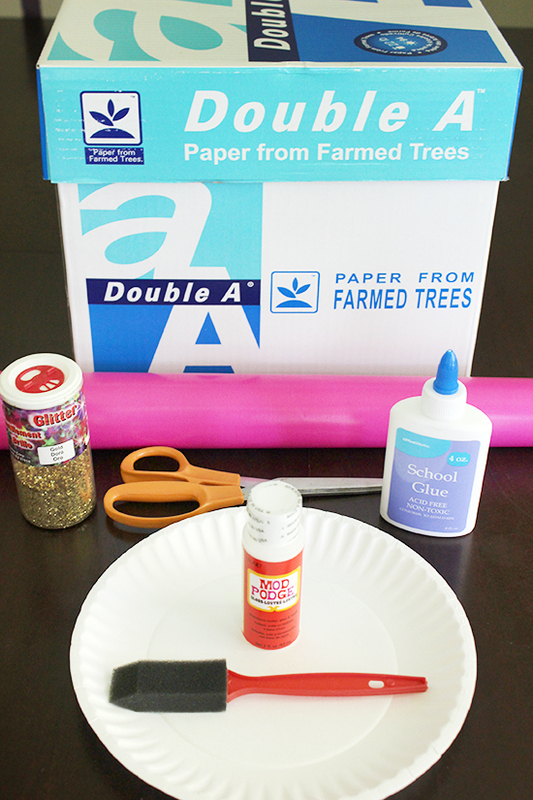 Another thing I included in my box were fun activities we could do together. 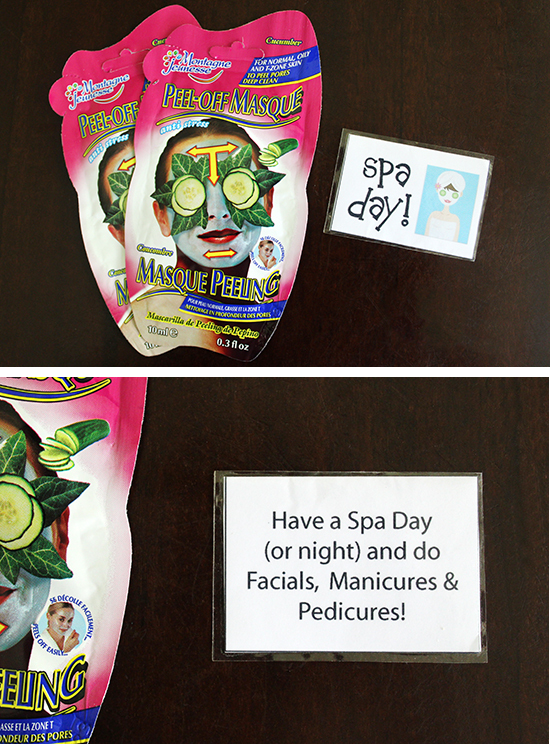 A "Spa Day" is something I already have all of the tools to pull off, but to make it extra-special, I grabbed some cheapie masks from the Walmart clearance section, and if she chooses a Spa Day she can also choose a mask to use. She LOVES this treat! I made some additional cards based on some of the things she likes to do (that we don't do all of the time.) I usually keep ice cream in the freezer, but going out to get a cone is a treat. On movie night, she can choose a movie to rent and we transform the Den with pillows and blankets, and have popcorn and candy. I always keep a box of cake mix and a can of icing in the pantry for "Bake Cupcakes" (don't forget the sprinkles! ), and her school had an Ice Cream Day every Friday, so this card means that I'll send the money to school for a treat that day. The cards are easy to make; Just cut them out, fold in half, and tape together. I went a step further and laminated our so they would last longer. 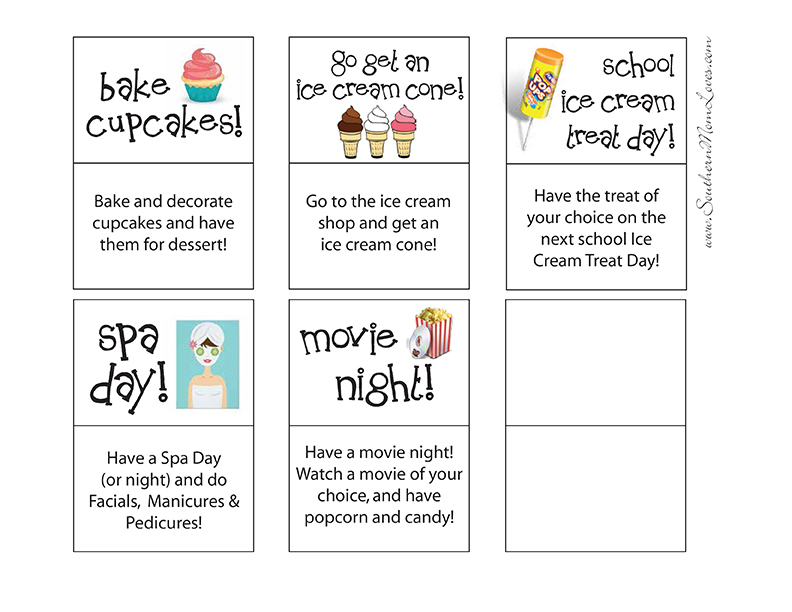 Get the printable Reward Cards PDF here. You can use stickers, stars, stamps, or checkmarks for each good behavior, or each day-full of good behaviors. Depending on your own child, you can let them choose from the Treasure Box once they've filled one row, or the whole sheet. You decide how challenging it should be, but keep in mind that younger kids will totally forget about the system if it's too hard to get the rewards. 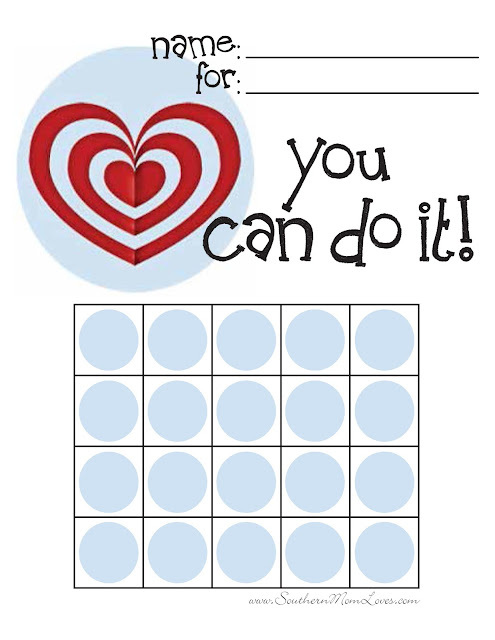 Get the printable Behavior Chart here. This system can also be used for older kids, but the rewards should be more on their level. For instance, my older child's rewards were things like 2 extra hours of video game time to be used whenever he liked (as long as homework and chores were done), and this worked for him because they're only allowed to play on Fridays, so to be able to play during the week was a treat. He also loves Nanoblocks, so I picked up a few sets and put them in a box for him to pick from. These were pretty expensive, so he had to accomplish more to receive the reward. Use your own judgement; After all, you know your kids best! I hope this post helps you organize and implement your own Good Behavior system! Do you have a system at home to help your kids achieve good behavior? What kind of rewards are your kids favorites? 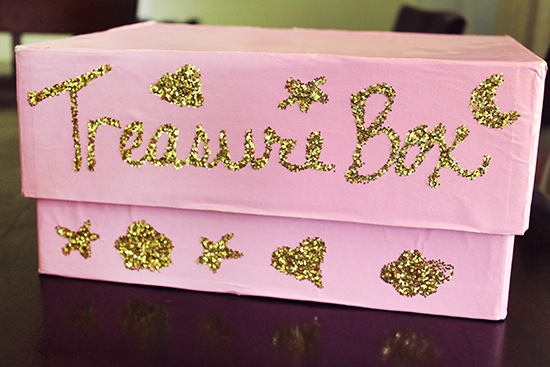 Do you think a Treasure Box would help in your home? I love to hear your comments!